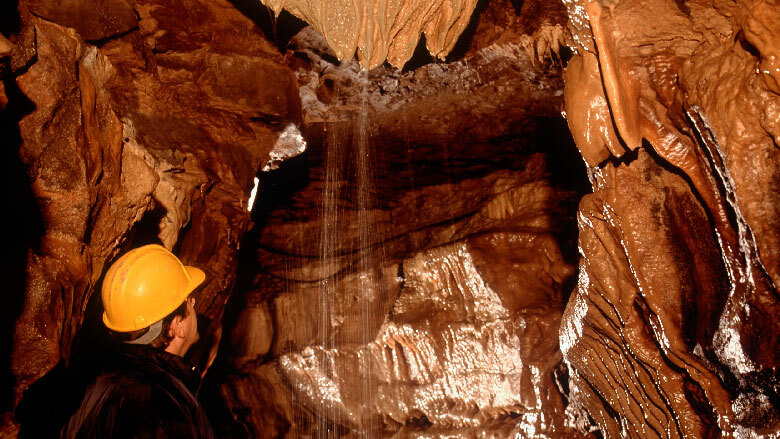 A selection of features from the longest cave tour in Britain. 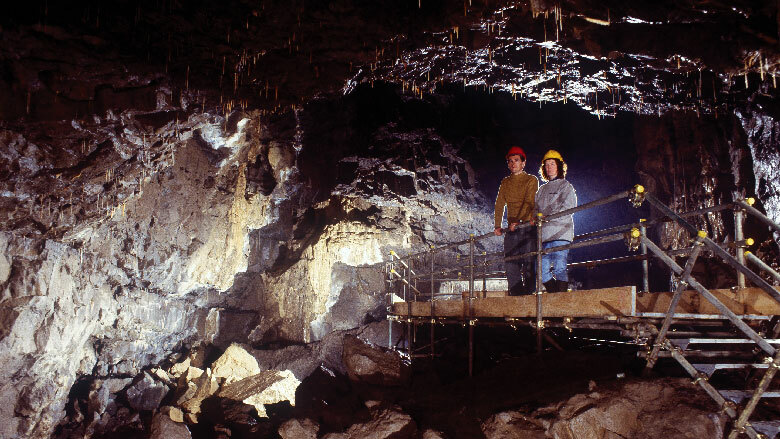 White Scar Cave is a member of the International Show Caves Association. Entering the cave, visitors become aware of a faint sound that gets louder as they walk further in. Suddenly they turn a corner and find the first waterfall, which after wet weather literally thunders into a rocky pool. The waterfall was the first feature discovered by Christopher Long in 1923. In full spate the weight of water cascading down each minute is about fifty-five tonnes. In August 1923 Cambridge student Christopher Long was on holiday in the dales. He noticed a slight fissure in the ground, and decided to investigate. Spurred on by the distant roar of water, he struggled over jagged rocks and through pools, until eventually he found himself at the foot of a waterfall. On subsequent expeditions, Long swam across the subterranean lakes and squeezed past a massive boulder, only to find his path blocked by a jumbled mass of rocks. The Witch's Fingers seem to have a particular fascination for some of our younger visitors. Perhaps it is the Harry Potter phenomenon, but anything connected with the supernatural seems to grab their interest. Geologists will calmly explain that the curious formation results from the operation of entirely natural forces, but some people remain unconvinced. See what you think. The rock floor of an ancient sea is exposed at the cave entrance. Horizontal layers of limestone form the cave roof, but the walls and floors are cut into nearly vertical slate beds. These slates are 400 million years old and were crumpled into their vertical alignment 100 million years before the limestone was deposited. The boundary between the two is called an unconformity. 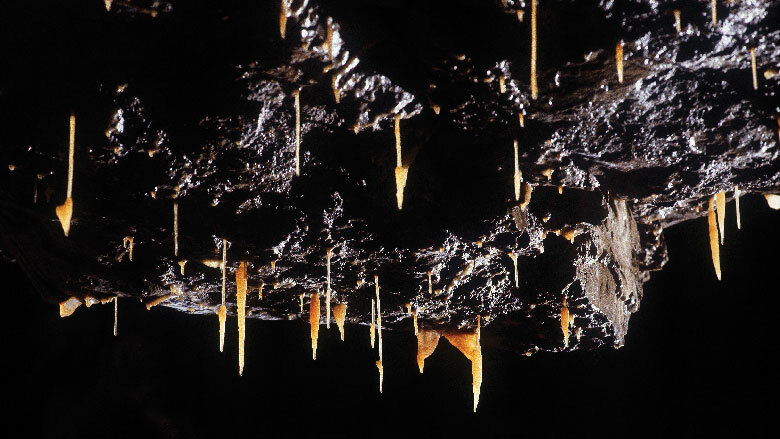 Stalagmites grow upwards where drops of mineral-rich water land. They can develop in strange ways, and we think you will agree that the Judge's Head is an interesting example of nature's handiwork. Viewed in profile the judge shows off his full-bottomed wig, forehead, nose and pugnacious chin. Of course he exists only in our imaginations, but the effect is uncanny. In places the cave flowstone has grown so thick that the cave trail is narrowed. At one point - the squeeze - it is necessary for visitors to pass through sideways. Nature is having having a bit of fun with us, but don't worry, it is wider than it looks. There is little danger of you embarrassing yourself by getting stuck and needing the cave rescue team! In ninety-two years this has never happened. 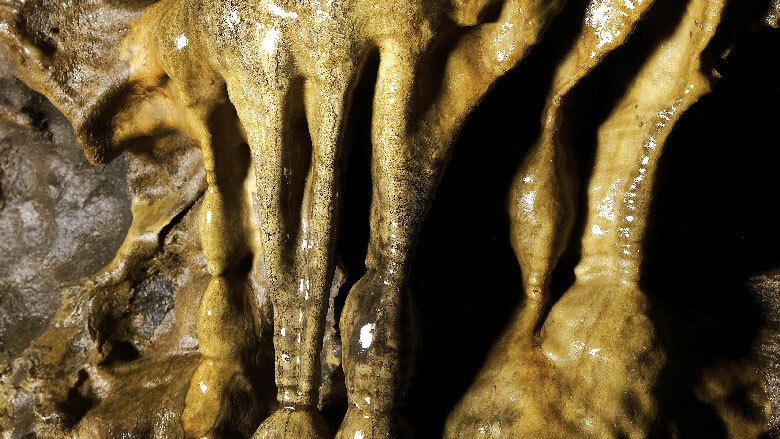 The botanical name was bestowed on this fine formation in the early days of the exploration of the cave system. 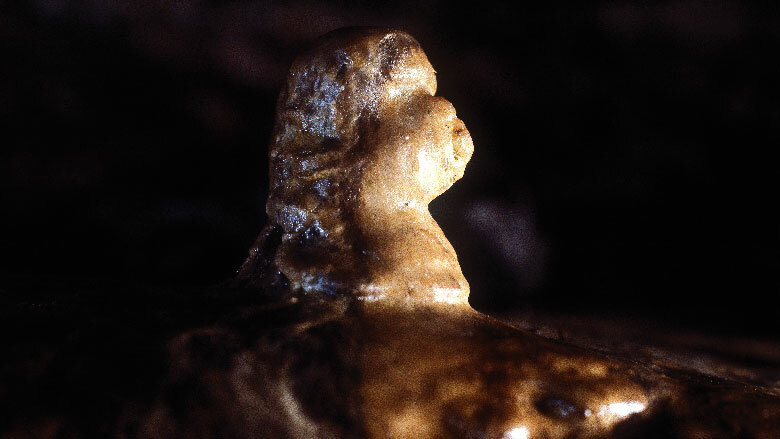 The 'stalk' of the lily is an example of a stalagmitic column, where the stalactite growing downwards and the stalagmite growing upwards join together. The 'petals' are known as cave drapery, where calcite takes the shape of folds resembling cloth. It is part of the folklore of the cave that you should try to avoid being dripped on by the Devil's Tongue. Different guides will tell you different reasons why this is inadvisable, but so far we have heard no reports of anyone being harmed if splashed. 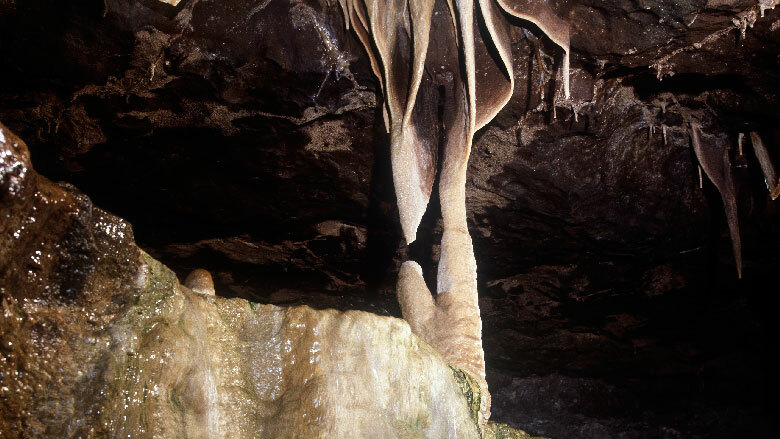 Seriously though, the tongue is a fine specimen of flowstone hanging from the cave roof. It is still growing! For many visitors the small features have just as much interest as the big spectacular stuff. These delicate orange stalactites just cry out to be nicknamed carrots. The colour usually indicates the presence of chemical compounds of iron. The variety of shapes depends on various forces such as capillary action and air currents. In our opinion they are strikingly beautiful. In 1991 major works were undertaken to extend visitor access. 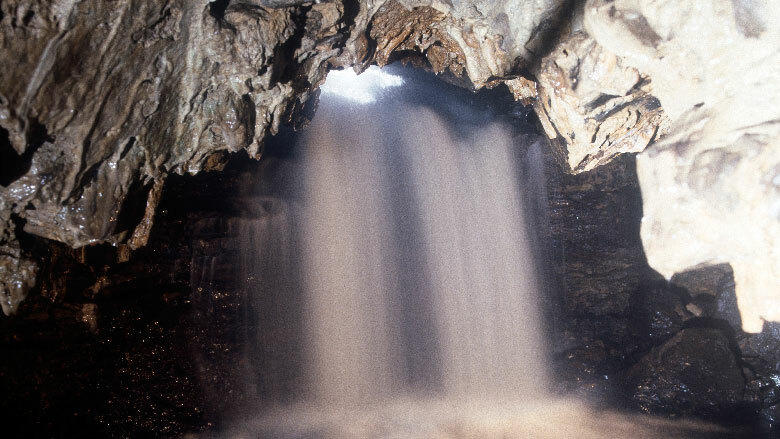 A 65-metre sloping tunnel was driven to connect the stream cave with the Battlefield Cavern. The work was undertaken by a firm of tin miners from Cornwall. Blasting the first section of tunnel involved the miners standing chest deep in very cold water half a mile underground. Huge quantities of rock had to be removed. Ever since its discovery in 1923 White Scar has attracted cave explorers. The system was investigated by members of the Happy Wanderers caving club, and it was they who discovered a massive chamber and named it Battlefield Cavern. 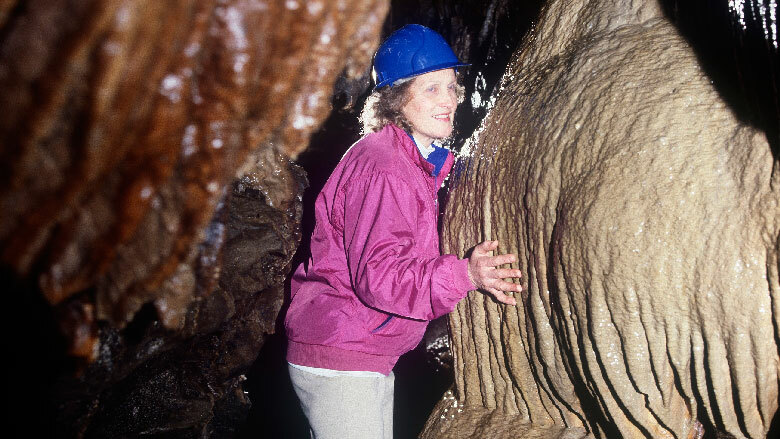 The first person ever to squeeze into the cavern was teenager Hilda Guthrie. The 1991 tunnel bypasses the tortuous and slippery climb made by Hilda and her friends. 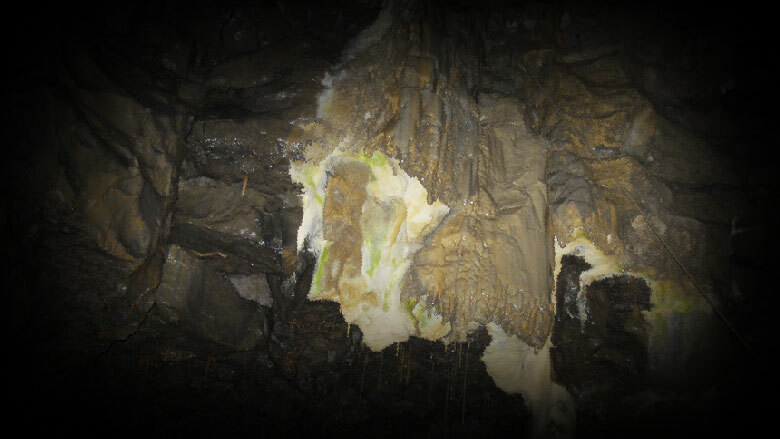 At the far end of the Battlefield Cavern, on the rock wall, is a white shape formed from the mineral calcite. It is known as The Face, and once you have figured it out you will see why. What it demonstrates is that we have evolved with innate cognitive powers of facial recognition. To know who was friend and who was foe, our primitive ancestors had to be able to recognise faces. What peculiar phenomenon sometimes happens at closing time? A disembodied murmuring voice follows the last guide out of the cave. Scary?